Businesses delivered a jolt of strength to the economy by creating 268,000 jobs in April, the biggest monthly total in more than five years. American companies are on a hiring spree. Businesses delivered a jolt of strength to the economy by creating 268,000 jobs in April, the biggest monthly total in more than five years. The gains were solid across an array of industries, even beleaguered construction. It was the third month in a row of at least 200,000 new jobs. The private sector has added jobs for 14 consecutive months. Even a slight rise in the unemployment rate to 9 percent appears to be a quirk. The job growth was better than economists expected and perhaps the strongest sign yet that what they call a “virtuous cycle” has taken hold: When people spend more, corporate earnings rise, leading to more hiring and then more spending. 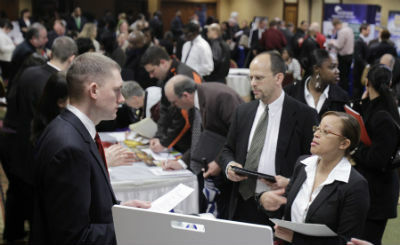 Companies have added more than 200,000 jobs for three months in a row. Those include higher prices for crude oil and gas. But energy prices fell sharply earlier this week, apparently reflecting lower consumption in the United States and a stronger dollar. Analysts think the price of gas may have peaked for the summer at about $4 a gallon. The rise in the unemployment rate, to 9 percent in April from 8.8 percent the month, was the first increase since November. But it appeared to be because of a temporary disparity in two surveys the government uses to track jobs. Wall Street was pleased by Friday’s report from the Labor Department. The Dow Jones industrials rose more than 150 points shortly after the opening bell. The Dow closed up 55 points, or 0.4 percent. Businesses added jobs in April across the economy. Retailers, factories, financial companies, education, health care and the construction industry all reported gains. And the government said the job gains it reported for March and February turned out to be even stronger than previously thought. Private employers have now added jobs for 14 straight months. Economists say companies are paying for new hires by starting to spend some of the almost $2 trillion in cash that businesses stockpiled after the recession ended in June 2009. Analysts have said the use of corporate cash reserves is the most effective way to strengthen the job market. Once again, governments at the federal, state and local levels all cut jobs — 24,000 in April. Counting those cuts, the economy as a whole added 244,000 jobs last month. The private-sector job gains were the most since February 2006. “It is a sigh of relief: Economic momentum has not been lost,” said Sung Won Sohn, economist at California State University. He said he was surprised that energy prices hadn’t scared businesses away from hiring more. “We’ve made this progress at a time when our economy’s been facing some serious headwinds,” the president told workers at a transmission plant in Indiana. He cited high gas prices and the earthquake in Japan. Average hourly earnings rose to $22.95 in April, up 2 cents from March. Pay gains are trailing inflation. Over the past year, wages have grown 1.9 percent, while inflation has come in at 2.7 percent. There was no evidence that the disaster in Japan, which disrupted supplies of some car parts, led the U.S. auto industry to cut jobs last month. All three Detroit car companies have been hiring at factories and in engineering departments. Among the companies using more of their cash to hire is Amazon.com. It’s also spending more on new facilities, including plans to add 10 distribution centers this year. A warehouse in Washington state will create several hundred jobs, and a customer service center in West Virginia will add 200 jobs. “We’re just seeing tremendous growth, and because of that we’re having to invest in a lot of capacity,” Thomas Szkutak, Amazon’s chief financial officer, said last week. Even with last month’s burst of hiring, 13.7 million people remained unemployed in April. That’s double the number when the recession began in December 2007. Including part-time workers who would rather be working full-time and people who have given up looking altogether, roughly 25 million are “underemployed.” They represent 15.9 percent of the work force, the highest proportion since February. The two surveys the government uses to gauge the job market can diverge sharply from time to time. That appeared to account for the increase in the jobless rate in April. The surveys tend to even out. To calculate the number of jobs that companies have added or subtracted each month, the government surveys about 140,000 businesses and government agencies. That survey covers about a third of all workers in the United States. For the unemployment rate, it calls about 60,000 households and asks people if they’re working or looking for a job. This includes the self-employed, farm workers and domestic help — people not counted in the first survey. In April, the number of farm workers who said they had a job fell sharply. Economists suspect that may have been because of bad weather that delayed planting. It’s typical in economic recoveries for the unemployment rate to bounce around sometimes rather than falling month after month. In fact, economists think the rate will probably rise further this summer because more people start looking for work and are counted as unemployed. By the end of the year, though, economists say the rate should be back under 9 percent. Most analysts say the factors that held back overall economic growth at the start of the year, including higher gas prices and lower consumer spending, were probably temporary. They predict the economy, which has been expanding for almost two years now, will grow ever faster for the rest of the year. Retailers reported strong April sales, partly because Easter fell later than usual but also because people appear to be more willing to spend. Auto companies say sales are brisk. And factories have expanded production this year at the fastest pace in a quarter-century. Nigel Gault, an economist at IHS Global Insight, cautioned that hiring could slow in the coming months, as suggested by a big increase in first-time applications for unemployment benefits over the past month. But the job gains of the past three months, which average 233,000 for the government and private sector combined, show “good momentum that should allow the economy to absorb the twin shocks from the Middle East and Japan without too much damage,” Gault said. Associated Press Writers Christopher S. Rugaber and Ben Feller in Washington and Tom Krisher in Detroit contributed to this report.